I always enjoy these messages from The Divine Feminine. I’ve heard and read many over the years I’ve spent at Rosemary’s side. They are always rich with wisdom yet well grounded and practical. And because I’ve heard so many I also know they are genuine. So I pay attention when they speak through Rosemary! The key to this message is in the very first lines: The flames are licking at the Doors of Change. Those who fear change are trying to engulf the opportunities in flames so that you and others will not walk through them. Do not let these fear-mongers paralyze you. Fear is one of the chief emotions that impacts our willingness, even our very ability to change. We fear change because we don’t know what is on the other side of that door. We know what is on this side and too often we are either too comfortable or too complacent with the status quo to consider what may be on the other side, even if it could be wonderful! The trouble with comfort and complacency is the inevitability of change. The Divine Feminine say: The evolutionary forces of the Universe are not static. They are always and forever moving forward, taking with them those who are connected to growth and leaving behind those who wish to go backward, which is the same as attempting to stand still. There is no standing still. There is only moving forward or being swamped by the Tides of Change. The status quo cannot stand against these formidable tides. Consider some of the Hubble pictures Rosemary posts in her Ezine! 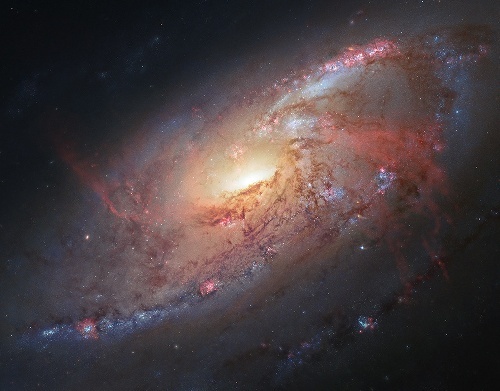 I’ve included one here (Galaxy M106) to illustrate this point. Imagine the immensity and the enormous energy represented in this galactic “whirlpool.” This is the energy of change alive in the Universe! Yes, “resistance is futile”! We live in a dynamic Universe and The Divine Feminine are suggesting, warning, that if we try to stand still we will be inundated. There is another force that works to keep us in fear of change; that force is greed. For many the status quo means continued profits; change may impact those profits. Again, the opportunity on the other side of the doorway is veiled; there may be risk involved. There is less risk in the status quo, right? Yes, if the only concern is for the short term; this quarter’s over last quarter’s and last year’s quarter returns. But can the forces of greed resist the coming changes any better than the forces of fear? Just as change and opportunity are two sides of the same coin, we can look at fear and greed in the same way. Greed is a fear of not having enough; it is born from a sense of lack. Much is never enough. Too much is better but still not enough! There is a strong resemblance here among change, fear and greed. We have to step through this doorway, even as the flames of fear and greed lick the frame and turn us away. Opportunity is the only way to approach change. Yes, there are unknowns beyond the doorway; yes, there are risks that must be faced. But the changes are coming, are here, whether we resist them or not. It is far better to ride the tide of this transformative time and rise with the opportunities that flow our way. Seize them, not as life lines, not out of greed or the need for gain, but for advancement, for the evolution of humanity, of the Universe. The force of evolution is here and will press on with us or without us. Are you ready for the evolutionary ride of your life? Grab hold!